Beautiful certificate from the Department of Marine and Fisheries issued in 1924. 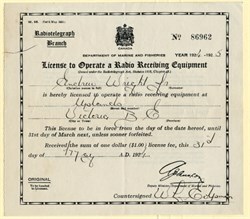 This historic document was printed by the Radiotelegraph Branch and has an ornate border around it with a vignette of a Knight inside of a crest. This item has the signatures of the Deputy Minister, and Countersigner, and is over 86 years old. The license was issued to Andrew Wright, Sr.